The Town Hall has disabled facilities including an stair lift and disabled toilet. Access is via the rear of the Town Hall, where there is also a small car park. Public Toilets - St Mary's Street toilet is a multi use facility; which is suitable for disabled users. This is managed by the Parish Council. 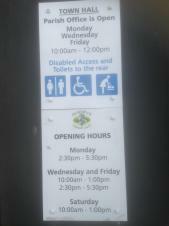 There is also a disabled toilet in Stamages Lane car park run by Stroud District Council.